For a country that is scared to sneeze in case it is misconstrued as a political view leading to infinite incarceration in the squalid prison opposite the British Embassy, ‘True Noon’ was a surprisingly open piece of cinematography. A thousand curious onlookers cramped into the auditorium with press camera poised to capture their reaction at this movie premiere. Clumsily sneaking in to any cinema when you are beyond been fashionably late is one thing, but whilst the revered beloved director is introducing his ‘baby’ is particularly, lets say, rude. However, the speeches continued; the cameraman, the producer, the Swiss funders, the lead actor who was presented with Tajik traditional garments, the writer, and the donkey from scene twenty three. Then in refreshing spontaneity everyone was presented with ornate bundles of flowers, first from the organisers, then from members of the audience who hastily leaped on the stage, where they were by hit a sudden barrier of shyness, and humbly presented their bouquets to their on screen hero’s. 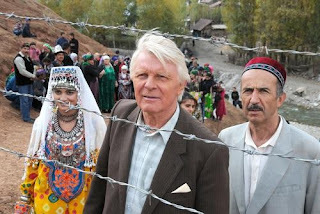 The film depicted life in upper and lower ‘Safili’ villages that are separated by a barbed wire fence redrawing the tajik / kyrgizstan border after the break up of the soviet union. The wise old weatherman desperate to see his family, who are in Russia, is keen to pass over his duties to a bright young girl in the village who in turn is to be married to a handsome tajik boy. The fence divides bride from the groom, the upper and lower village, cuts off schools and medical facilities and destroys the community. The village continue to trade, teach, flirt and impregnate their livestock through the fence, until the soviet spoil the party by indiscriminately planting landmines. The wise old weatherman is called upon to ensure that the wedding will proceed, the community will survive and no more donkeys are blown up. The swipe at soviet policy and consequential behaviour was refreshing; however, the biggest murmur in the crowd was prompted by a husband, desperate for a son having already three daughters, playfully tickling his wife’s belly on the veranda. Although we are in a muslim dominated state, the everyday reminders are more discrete than in other nations, and fraternising on the screen provoked a noticeably rumbling of discontentment. A polite round of applause and a flowers shower wrapped up the evening as movie-goers and actors escaped the stuffy auditorium to share cigarettes and discuss the pending Ramadam.